Looking for the main SocialAdr site? Most people who get started in internet marketing first learn about affiliate marketing. It’s a great stepping stone and an excellent way to learn the basics of IM. It even forces you to learn about SEO, since you’re told how important it is to drive organic traffic to your site. I personally think affiliate marketing is one of the easiest ways to earn money quickly, with very low overhead. DoSocial is a platform that allows you to manage your social media profiles/accounts in an easy way. If you’ve ever used services like Hootsuite or OnlyWire, it’s similar in concept, but in our (completely biased, of course) option it’s easier to use and offers a lot of functionality for free. Setup “Identities” for each marketing campaign. They represent a business, or brand, or niche, or client, etc. We’ve just rolled out some updates to our API. Also, we’ve added integration to a popular blogging platform and another social bookmarking site. Check our home page for the complete list of social sites we work with. New 6 month and Annual billing periods available for subscriptions, see Upgrade page. These are discounted at 10% and 25% on top of whatever other discounts you may receive, so it’s a heckuva deal. Want Twitter Followers? Now it’s easy. Great news – you can now setup campaigns to get Twitter Followers. 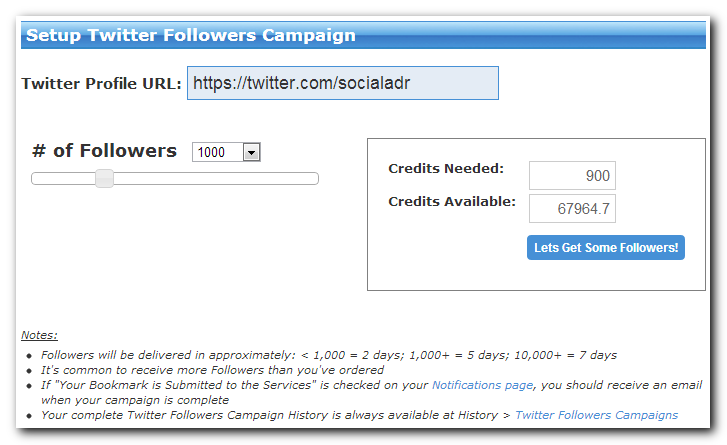 If you have enough credits in your account, just click the “Lets Get Some Followers!” button to start the campaign. If you don’t, you’ll see a “Buy Credits” button, that takes you to the Instant Credits page, where you can get more. If “Your Bookmark is Submitted to the Services” is checked on your Notifications page, you should receive an email when your campaign is complete. © SocialAdr. All Rights Reserved.